This is so far my ultimate Screenshot macro. The pngquant and advpng parts of the macro are streamlined subsets from my PNG Optimizer macro. screencapture is part of OS X. pngquant and advpng are third-party tools. The macro is functional also without pngquant and advpng, but, of course you won’t have PNG quantization and compression. **Open here** for _how to install pngquant and advpng_. Alternatively you can install it via MacPorts. However the MacPorts version got stuck at 2.1 whereas the most recent version is 2.6. Alternatively you find the source code for the latest version on the Advance Projects site (scroll down to “AdvanceCOMP” and download the .tar.gz file; the instructions are in the “INSTALL” file and usually it compiles w/o problems). Alternatively you can install it via MacPorts. They have the most recent version in the repository (1.20). Press the hotkey F4 to take a screenshot with the current settings. Press the hotkey ⌘F4 to take a screenshot while toggling between fullscreen and rectangular selection / window mode (dependent of the current setting). Press the hotkey ⇧F4 to take a screenshot and send it to Preview. Press the hotkey ⌥F4 to launch the macro in GUI mode and to access the settings. See below. You can also combine ⇧ and ⌘. Press the hotkey ⌥F4 to bring up the main window. Optionally change the name of the screenshot and other settings. Press Return to take the screenshot or Save to exit. **Open here** for a detailed description of the settings. Leave the field empty to save the screenshot to the clipboard. The settings for pngquant and advpng. Leave the field empty to disable pngquant. Pngquant will always produce a new file with a -or8 suffix, or -fs8 when dithering is activated. If you see that the quality is not satisfying you can always go back to the original file. Enable (1) or disable (0) dithering, or set it to something between 0 and 1. Dithering increases file size and you can disable it (or set it to something low) for many screenshots. 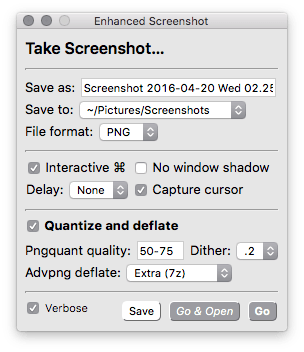 However, you should use it for screenshots containing larger halftone or photo-like elements, for example window shadows or the typical OS X Desktop background. The deflate compression library advpng should use. Since pngquant already applies compression, zlib won't improve compression much, but 7z and zopfli will. This is in any case a lossless compression. If pngquant is enabled advpng will run on pngquant's output file, otherwise on the original screenshot file. Takes the screenshot and opens it with Preview. Use this if you want to do some highlighting, annotating or cropping in Preview. Opens an info window after the screenshot. Select this if you want to see what exactly is happening or for debugging. It also shows you the effective quality and the compression savings. How to activate native screenshot(s) from KM? Great example of the KM HTML Prompt action! Simplifying Filing: Move Selected Finder File to "Pick-A-Folder"
Fixed HTML prompt for Sierra. Changed default quality for pngquant. Updated the (optional) Swift script for Swift 3. This is awesome Tom, I had apparently downloaded this already and hadn’t come back to it yet until I went searching again for something like this. @Tom this is incredibly good. I have been meaning to try homebrew too. You might also be interested in my Screenshot Prettyfier AppleScript, which is what I am actually still using. It is an evolution from the macro here, but it doesn’t cover all functions.